We met at Heathrow on the 29th January. Sheena had organised the trip and invited some like-minded friends, who in turn had invited some of their friends. The result was a group of women who were fun-loving, friendly and up for a challenge! Morag and Leslie competed for the prize for travelling the longest distance, hailing from Texas and Australia respectively. Mountain experience was varied and I had personally trekked with Sheena, Cath and Maria and was excited to catch up the group. Sheena is slowly heading towards the seven summits (even if she won’t admit it quite yet) spurred on by the recent present of a climbing book signed by Ranalph Fienes himself. The fact that he personally tells her to ‘go for the big 7’ should annul any doubt that it will eventually happen. Cath was on her third mountain after taking the staggering jump from Koto Kinabalu to Aconcagua (!) in 2015 where she was joined by myself and Sheena. Sandra has also been up Koto Kinabalu (but not with Cath). Maria has been up to Everest Base Camp with myself and Sheena. 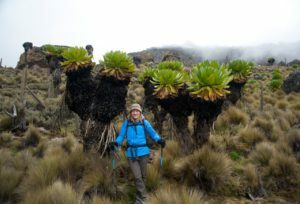 Collette climbed Kili, also with Sheena. Sue has completed the Anapurna trek, whilst Justine, Morag and Leslie have never been to altitude before. And if you can get your head around all of that then you’re doing better than I did! And me I’m a specialist paramedic in urgent care (SPUC!) by trade (with a background in hazardous area response) but have been assisting on expeditions since 2010 as either a leader or medic. Although I have been on many expeditions to Africa, this was my first time climbing Mt Kenya. I had heard wonderful things about the mountain and the trek and was therefore very excited to be heading up it, especially with such an amazing group of women. The expedition started as all good ones should – lying next to a pool in 20-something heat. This was especially glorious as 24 hours previously we’d left a cold January London. The next day we were up and off, ready to start our adventure. Trucks took us to our starting point, with a quick stop en-route as Sheena spied some juicy looking mangos that she just had to have! Unfortunately one of the trucks broke down about 20k from its goal which allowed one half of the group to get ahead on their ‘steps’ for the day (fitbit reference!) as they walked along the path until the other truck came back to pick them up. Once we were all reunited and had had some lunch, we set off. It had started raining whilst we were having our lunch but fortunately it eased as began. We arrived at our first camp which was beside a beautiful blue lake. This was not only the first night in a tent on this exped, but the first night in a tent EVER for Justine. Talk about jumping in the deep end! Although she was following in the footsteps of Cath who had never slept in a tent until embarking on the Aconcagua expedition in 2015! These ladies are definitely made of stern stuff. The next day was tough but the ladies had all put in the necessary prep: staying slow (pole pole), drinking an obscene amount of fluid, consuming enough calories to fuel their bodies (even if they didn’t always feel like it!) and resting overnight (even if sleep was frustratingly illusive). Our second’s night camp looked fairly boring in comparison with the first. This was until we scaled the small ridge which encased the camp and found ourselves surrounded by the most beautiful lakes and mountain vegetation. The wildlife was abundant with birds and rock hyraxes all over the place! The guides informed us that these small dog / large guinea pig – looking animals are actually the closest living relative of the elephant! Apparently this is proved by the shape of their feet, although I don’t think any of us managed to get close enough to check. Today was Sandra’s birthday! Unfortunately, she had the worst luck and suffered from the effects of the altitude which can make you feel really rubbish. Undeterred by this, we proceeded to sing her happy birthday and force her to shovel down some food so she would have enough energy for the following day. I’m not entirely sure she thanked us for this, but the thought was there. The next day was our acclimatisation day and we had a lovely trek up and across the ridgeline and back down again. We also had our first glimpse of the spectacular gorge which a few of us went to explore in the afternoon. The rest of the group had a well-earned rest. The following day was another tough one but we had all banked energy from the day before and everyone arrived in camp in good time. I think it was at this point the realisation of the scale of the mountain hit, as the landscape turned very ‘lunar’ and there was a distinguishable temperature drop. This was also not helped by the intense hail storm that proceeded to batter the tents just after our arrival. At least it had held off until we had arrived in camp! We kept our spirits up by playing shithead (a card game that’s a fundamental part of climbing any mountain) and talking to Helen in the 360 office via the satphone. After dinner we made plans for the summit attempt the following morning, splitting into three groups with the intention of all arriving at the top at the same time. Then it was another yummy dinner (how do these guys make such amazing food in such inhospitable environments?!) and off to bed to attempt to sleep, or at least partake in some ‘active resting’! The following morning, we set off in the dark with our head torches on, guided expertly by the local crew that we had come to trust and admire. These guys really are super human and such experts in everything they do. 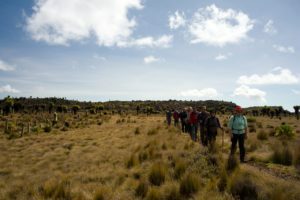 It was hard going but the whole group just continued with the same sense of support, comradery, humour and pig-headed perseverance that they had maintained throughout the expedition. Just as the sun was rising, we made it! The whole group, standing at the top of the second highest mountain in Africa, watching the sunrise over the spectacular landscape, a whopping 4985 metres above sea level. 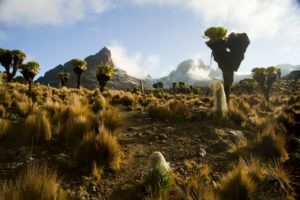 Just because this mountain is Kilimanjaro’s little brother, don’t let it fool you into thinking it lets you get away with anything. It’s a giant in its own right and demands a colossal effort before it will give up its summit. These ladies had been well and truly tested and had not been found lacking. 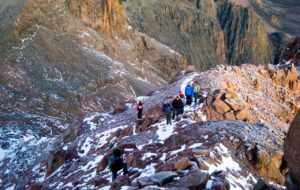 The fact that the whole group got to the top is testament to the prep that every member of the team put into this trip, both before they even left the UK, once in Africa and on the mountain. The support and team work was second to none and all these things are essential if a group are to even have a chance of successfully scaling a beast like Kenya. 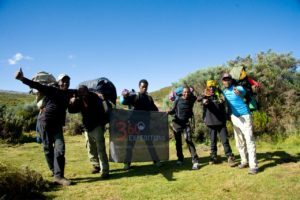 Not content with the summit and decent to our next camp, the group decided that they were fit and raring to go and would like to continue down the mountain and complete half of the following day’s trek! This would mean we would leave the park earlier the next day and be back at the hotel around lunchtime (as opposed to the evening). Who I am to suggest that the promise of a sunny poolside and a cold G&T could make another 5 hours of walking (on top of the 8.5 in took to get to the summit and down again) sound like a good idea? 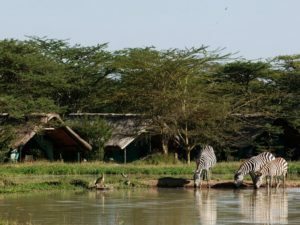 Continuing with the determination and resilience shown throughout the trip, the ladies shouldered their packs and marched onwards towards that pool and 30 degree heat…!